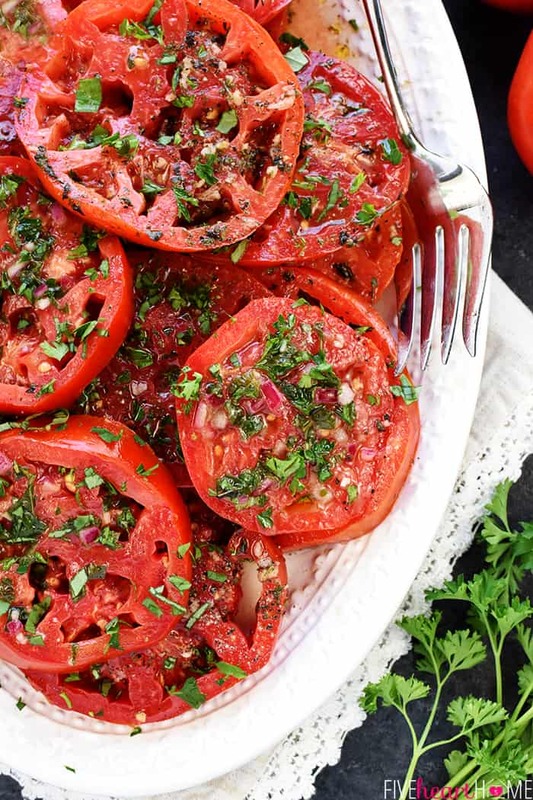 Ripe, juicy tomatoes soak up olive oil, red wine vinegar, onion, garlic, & fresh herbs in Marinated Tomatoes, a zesty summer salad or a versatile side dish! ‘Tis the season for homegrown tomatoes! Thanks to my father-in-law’s bountiful garden, by this time every summer, we’re positively swimming in big, juicy, deep red specimens of tomato perfection. We eat ’em sliced, with salt and pepper. On bread with good mayo for a tomato sandwich. Caprese-style…drizzled with balsamic, layered with fresh mozzarella, and sprinkled with basil. Roasted. Stuffed. On pizza. Over pasta. In marinara. In salsa. In salads. 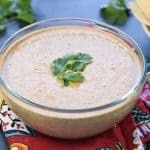 But there can never be too many ways to enjoy garden fresh tomatoes, so why not add another recipe to the ol’ repertoire? Marinated Tomatoes are effortless to throw together with a handful of simple ingredients. 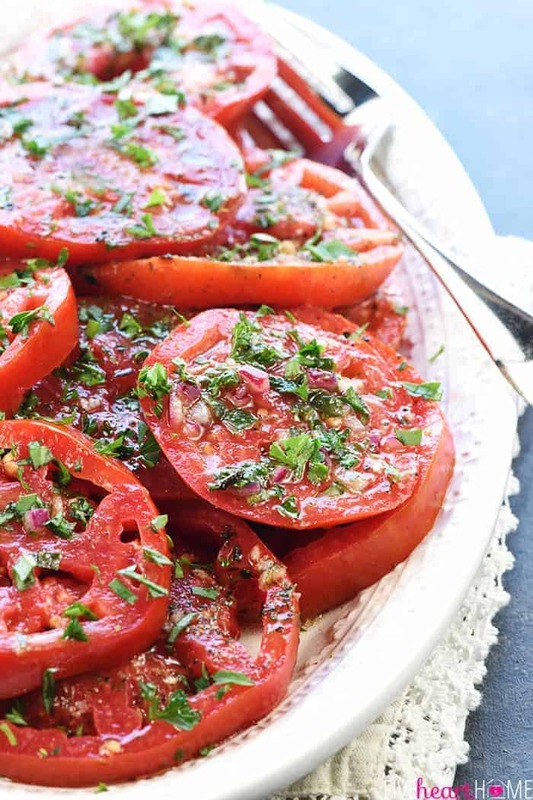 What I love most about this recipe, though, is that not only does the pure, tomato flavor shine through, but it’s actually enhanced by the vinegar, aromatics, and herbs. Another nice thing about this dish is that it’s totally customizable. 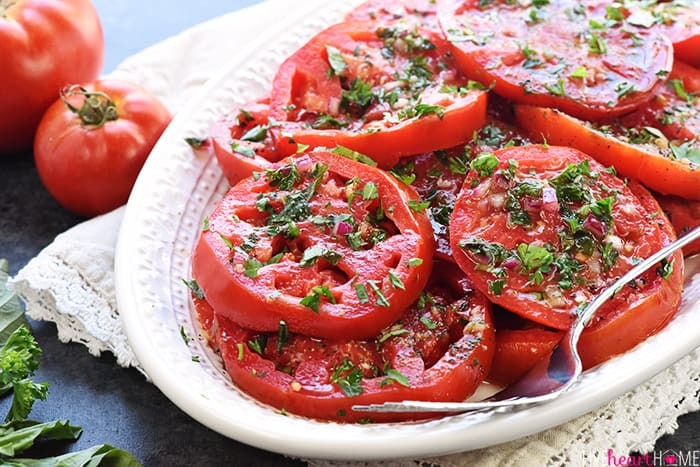 I happen to have lots of giant, beefsteak-sized tomatoes right now, so I cut them into thick slices, lay them in a shallow dish, and pour the marinade over the top. The large surface area of the slices allows them to really soak up the deliciousness. If your tomatoes are smaller, however, you could choose to cut them into wedges. Tiny little cherry or grape tomatoes could be halved. 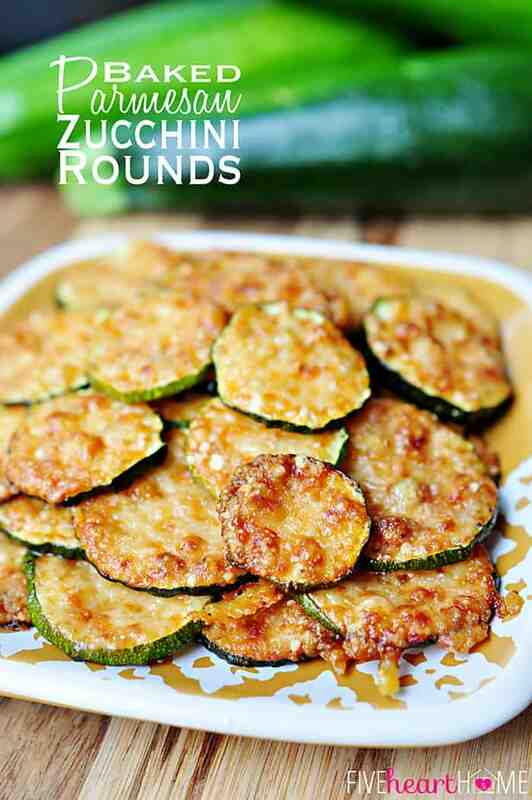 I recommend red wine vinegar for this recipe…it’s zippy without being overpowering. 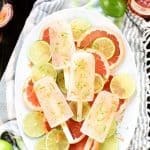 However you could also experiment with white wine vinegar, sherry vinegar, champagne vinegar, balsamic vinegar, apple cider vinegar…each one will add a different flavor profile to the dish. How long you choose to marinate the tomatoes is up to you. My preference is to marinate them in the fridge for 12 to 24 hours for lotsa’ flavor, then bring them back to room temperature before serving. Alternatively, if you have less time, you can marinate them on the countertop for just two or three hours. The infusion of flavor into the tomatoes will be less intense, but they’ll still be delicious. You can also customize the herbs for your Marinated Tomatoes. I highly recommend finely minced fresh herbs if you’ve got access to them — I typically use parsley and basil. But you can also use dried herbs. Just remember that since dried herbs are stronger and more concentrated, you’ll only need about 1/3 the amount as compared to fresh herbs. 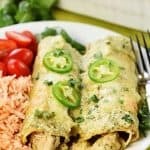 I’m a garlic gal, but I don’t go overboard with this recipe. One large or two small cloves are plenty. I prefer to crush my garlic in a garlic press or very, very finely mince it. 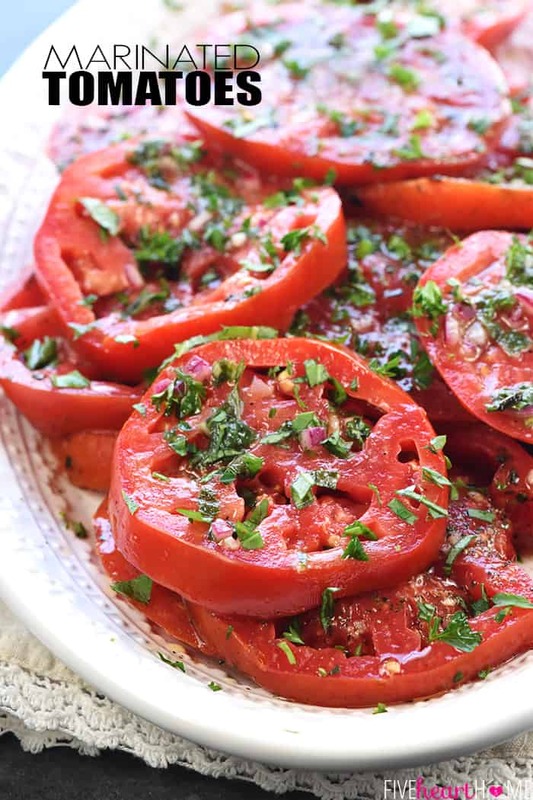 These Marinated Tomatoes are scrumptious on their own as a salad. Be sure to serve with crusty French bread to sop up all those magical juices! Or you can chop the tomatoes into smaller pieces and use as a topping for bruschetta. A few shavings of fresh Parmesan on top = HEAVEN. 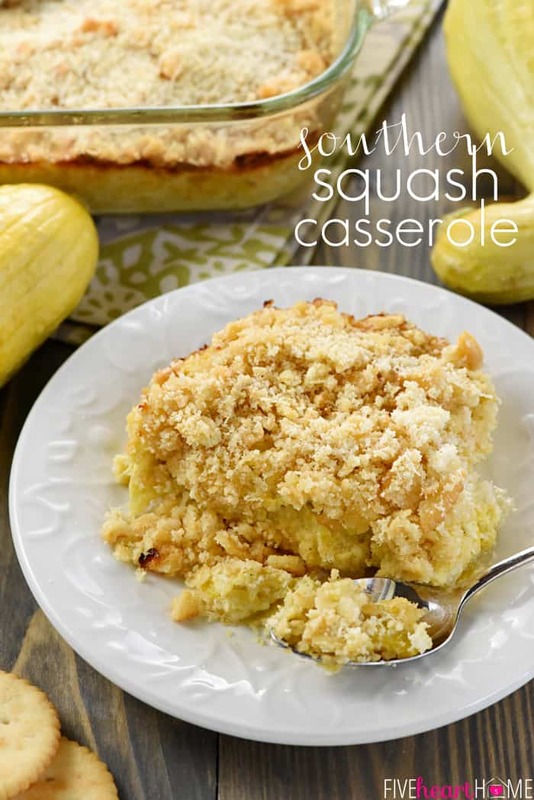 And see a video for this easy recipe below! 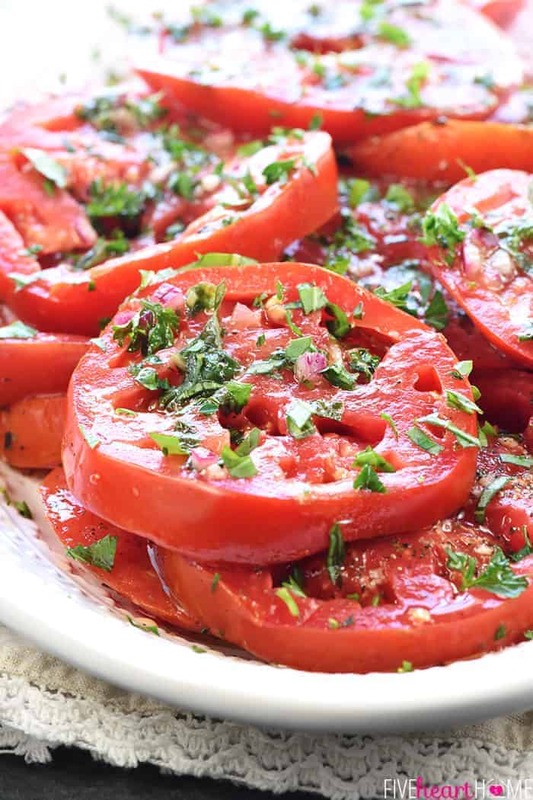 Cut the tomatoes into 1/2-inch thick slices and arrange in a single layer in a large, shallow dish. Measure the oil, vinegar, onion, garlic, parsley, basil, salt, and pepper in a jar with a tight-fitting lid. Shake vigorously to combine and evenly pour over the tomatoes in the dish. Cover and marinate for 2 to 3 hours on the counter, or 12 to 24 hours in the refrigerator. Bring chilled tomatoes to room temperature before serving. 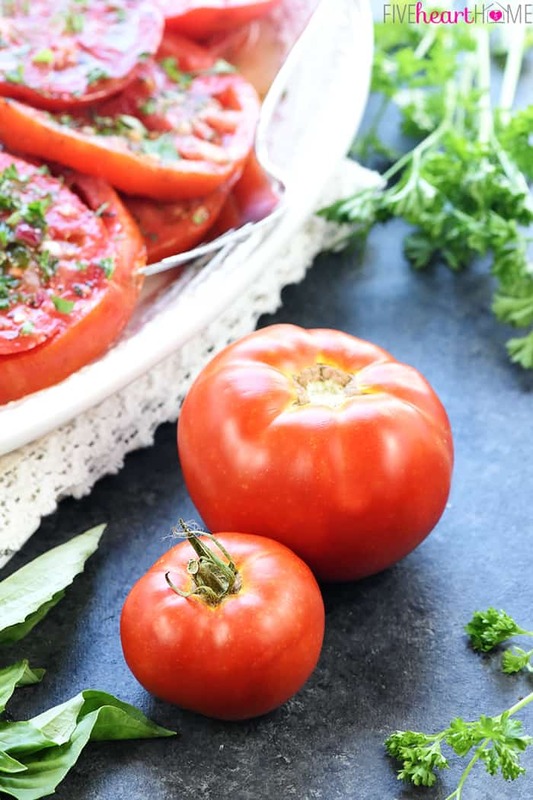 Transfer tomatoes to serving dishes, spoon juices over the tops, and garnish with additional chopped fresh herbs, if desired. Dried herbs are more potent than fresh, so you only need 1/3 the amount when using dried herbs. 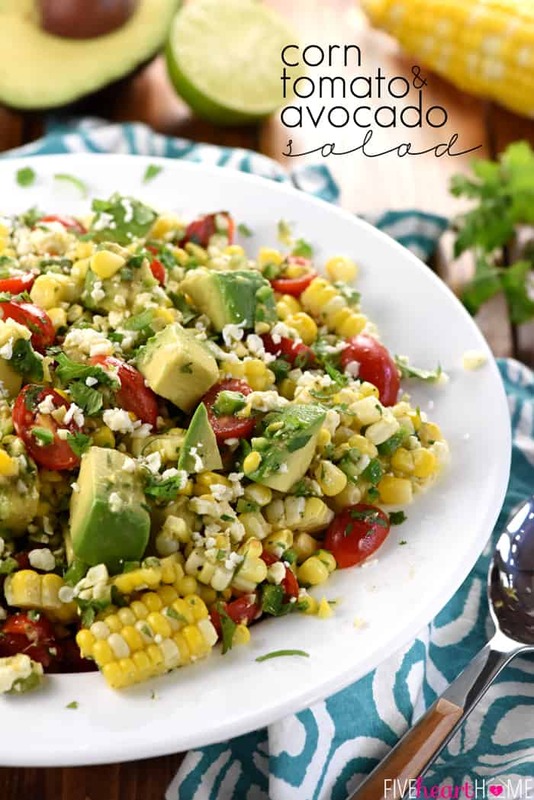 You may substitute 1 teaspoon dried parsley and 1 teaspoon dried basil for the fresh herbs in this recipe. You may also switch up the herbs you use. Love this!! Can’t wait for my tomatoes to ripen so I can try! Pinned and sharing! 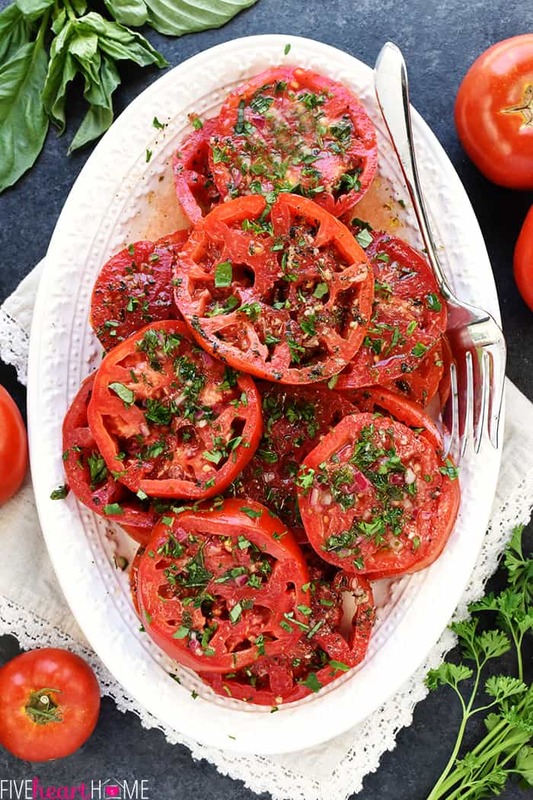 I have been searching for a simple summer tomato recipe like this. Reminds me of my father and his wonderful homegrown garden delights. YUM!!!! 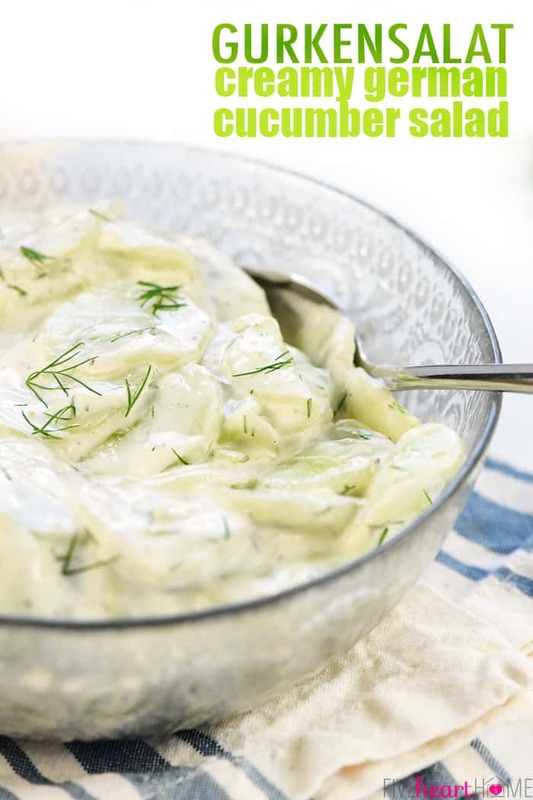 Thanks for this recipe, I was looking for salad recipes and came through this one on Pinterest. making it right now! Question- is there a reason you suggest bringing tomatoes to room temp before serving? Or is it a preference? I like cold tomatoes but don’t want to serve them cold if it will negatively impact the flavor. Thanks! Thank you for sharing. Looks so good! I love tomatoes but the ones in my backyard are not ripe yet. As soon as they are I’ll be making this recipe! Have made these several times when having company for dinner. Everyone loved them. Always like something I can make ahead. Very easy to put together. I make quite often. I use red wine vinegar and balsamic vinegar. I sprinkle dried Italian seasoning, s, p, garlic powder and some crumbled blue cheese or feta. Yum! You weren’t kidding! The marinated tomatoes were to die for. This is the first time I ever left any comments but I felt compelled to comment. Your recipe was for four to six. How about two? My husband and I ate the whole dish ourselves. Spoke to a friend of mine and shared the magic. Thank you so much. 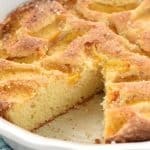 This recipe will be added to my must make pages. Sounds delicious but I would never chill tomatoes, it ruins the flavor. Made these today, had a small cucumber so I sliced it up and added to tomotoes. Was delicious. I made these and took them to a potluck yesterday. They were a huge hit! Everyone was like “oh, so fancy!”, even though they really aren’t, but they did look beautiful! Simple ingredients, prep time was like 10 minutes. Easiest “fancy” dish I’ve ever prepared! I’m still harvesting tomatoes here in western wa state, we are having a mild early fall. I used a combo of my beef and grape tomatoes. Followed the recipe and the proportions were right on. I used fresh parsley, basil and rosemary. I let them marinate at room temp for a couple hours. They tasted good at that point, but just a but sharp. By the time I served them at the potluck they had marinated in the fridge for about 24 hours and were amazingly good. The extra time let the sweetness of the tomatoes come out and balance the acid, and all the flavors had gotten so happy with each other! Topped them with some grated parmigiano reggiano and served with crusty bread. Soooo good! Thanks so much for this recipe. Sorry I’ve gone on so long, just very pleased to have found this fantastic way to enjoy our tomatoes! Next time balsamic, that is my favorite vinegar! I’m so happy these were a hit, Penny Sue…and I’m jealous you’re still harvesting tomatoes! This sounds amazing! I have a friend that slow roasts Roma tomatoes and uses in tomato sauce. Do you think this marinade could take the roasting flavor to a new level? I’m not sure how well marinated tomatoes would roast, Sandy? Let me know if you give it a try!